"This is a really great tuna salad recipe I got from a friend who used it in her catering service business many years ago. The secret ingredients are the curry and Parmesan cheese! 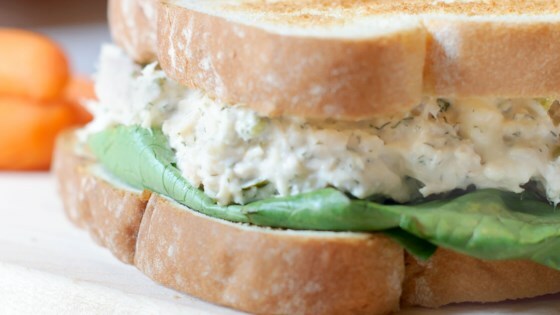 Odd combinations but this makes a terrific tuna sandwich! She used it for an appetizer with gourmet crackers and people always wanted her recipe. I have never tasted another tuna salad quite like this one, and it has been my favorite recipe for tuna salad for many, many years." In a medium bowl, stir together the tuna, mayonnaise, Parmesan cheese, and onion flakes. Season with curry powder, parsley, dill and garlic powder. Mix well and serve with crackers or on a sandwich. Very nice change of pace from the traditional tuna sandwich. Served this at a "Mad Hatter's Tea Party" recently and they were perfect! Will definity serve again!